Graceful shape, aesthetically pleasing to see, hear and touch. Available with the Magic Star silent play feature. The most popular upright piano in the Alex. Steinbach range. Predominantly due to the Queen Anne cabriole leg design, player-level versatility and Klaus Fenner’s extended string length design that produces a rich, resonant sound and tone. 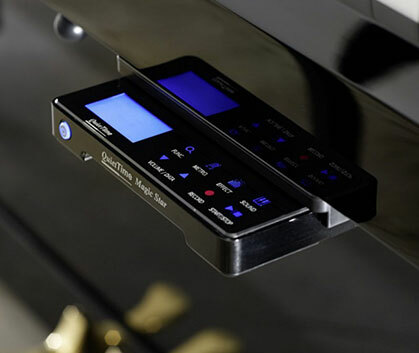 The Magic Star Silent Piano is a system that allows you to play your real acoustic piano silently through headphones. You can practice on your acoustic piano at any time of day and night without disturbing those around you! The inclusion of two stereo headphone jacks allows parents to sit alongside and listen to children practice, or two children to play the piano together without disturbing anyone. Easily change between acoustic piano and muted piano by moving a small lever under the keyboard. Magic Star only available in Ebony, Mahogany and Walnut Polish.